I bought this book a few months ago, during one of those big book events where you can buy books for less. As usual, I'd chosen about twelve books or so at first and had to select the ones I really wanted (which is always a difficult progress.) 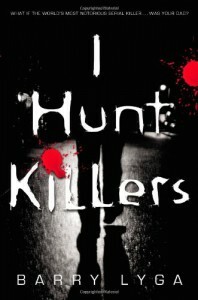 Fortunately, 'I Hunt Killers' made it and had been standing on my bookshelf ever since...Until now! To sum that up: Jazz has a very disturbing dad and an even more disturbing past. He was raised by a sociopath and this has obviously left some nasty mental scars, which is noticable throughout the whole book. For example: Jazz tends to hear Billy's voice in his head pointing out particular things about people and telling him what he should do and how he should act (to be like Dear Old Dad.) So that part was worked out really well - there's (more than) enough attention for Jazz' personal problems. And did foresee who the bad guy was? (Well, except for Billy that is. That guy is just plain disturbing.) Nope! My suspicions were raised high several times while reading - I even came up with this dr. Jekyll & dr. Hyde theory - but the other bad guy turned out to be someone I didn't expect him to be. + The psychological part of the book about how Jazz coped with the trauma of being brought up by a serial killer. Who gave him lessons. And tried to brainwash him. And made him do things. + The main character Jazz. He's just very interesting. + Billy Dent. I know I've called him disturbing several times already, but at the same time he's the perfect villain. He's so crazy and yet not. He's just...He gives me the creeps. - Although I found Jazz an awesome character, at some point I did get frustrated with him and just wanted him to stop making a fuss of being like his father. I mean, he'd just done things his father would never do! - I didn't totally get the ending. Well, a part of it. How Jazz connected some dots in the ending which never got explained but hey, that could just be me! In the end I'd recommend this book to anyone who wants to explore the thriller genre of YA books and to anyone who likes a book that gives you the creeps but is not feeling up to downright horror. A fluffy raven called Stan. Is it coincidence or something more sinister that draws them together? Many strange things collide in Laureth Peak's life one hot August weekend. Perhaps strangest of all is the way her dad had been acting lately And now he's disappeared. It looks as if his obsession with coincidence might have fatal consequences. Before I read this book I'd never heard of Marcus Sedgwick before. 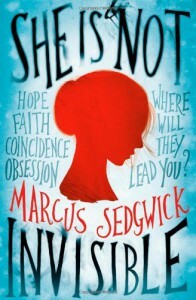 However, I have to confess that I did find She Is Not Invisible on another (Dutch) bookblog. That review left me quite curious, so when I came across this book in Waterstones I didn't hesitate and bought it; I'm glad I did! One of the first things you learn in chapter one is that Laureth is blind. (Now, this information was not on the back of my copy nor was it on the front of the cover or mentioned in any of the reviews printed in the book to make you read it. When I did some research I found other blurbs of the story in which Laureth's blindness does get "highlighted". ) I actually liked the fact that it was not mentioned on the back of my copy. Since I'd read the other review I knew the main character would be a blind girl, but if it weren't for that I would've only found out while reading. The reason I thought this to be so great is simple. Never is there a fuss being made about Laureth being blind in this book! Yes, of course she encounters people who react in all different ways to her disability but Laureth herself is pretty cool about it, for someone who can't see a damn thing. It's just a part of who she is and that's one of the things I really liked about She Is Not Invisible. Secondly, like almost all books this one too contains its share of love. Refreshingly enough, it's not about the romantic kind of love. There's no drama about misunderstandings (well, maybe there is a bit of those...Just not like that) and there's no love triangle. (Hallelujah! Nothing wrong with those, but sometimes you just want to read about something else.) Love in this book is more about family, and since that is very important too I'm happy there is a book like She Is Not Invisible to enjoy! + Again, how the writer describes Laureth's blindness. For example, since she's always been blind she doesn't know what colours are. I'd been wondering about that a few days before, I mean how do you imagine something in your mind's eye if you don't know any colours? And colours are also hard to describe to someone who can't see them...Just think about it! + The coincidences that ocurre in the book or really happened and are just used as examples. They managed to make the occasional shiver run down my spine. + The cover. 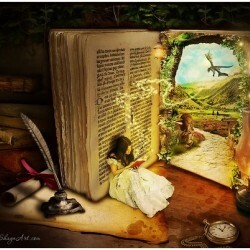 Yes, I admit, I tend to judge a book a bit by its cover. But hey, I just appreciate the work some cover artists put in a book (; Anyway, if you take a look at the cover you'll see the face of a girl against a city background which basically representates Laureth in New York. Plus where normally the girl's eyes would've been is the title with the word Invisible printed just a tad bigger. Major hint to blindness! So why haven't I given this book five stars? Well...I was promised 'an absorbing and fast-paced thriller' or 'a rollercoaster of a thriller'. 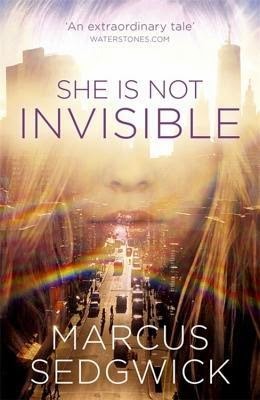 And although She Is Not Invisible certainly is fast-paced and absorbing, I couldn't help but not see this book as a thriller. Yes, it definitely is about solving a mystery but I experienced it more as a story about a journey. A story which really makes you think, to quote Waterstones. And sadly the ending seemed a bit abrupt to me. I won't spoil it for you guys but...I think the conclusion just differed from what I expected. With that said, I want to remind everyone that this book is great and I'd encourage you to read it! In the end I think if you're looking for a thriller you'd still enjoy this. However, if you're looking for "Something Else" you'll enjoy this book even more.